The raids on the Geneva Freeport have led directly to the return of well over 100 antiquities. However there was a similar raid on several facilities in Basel; several truckloads of antiquities have been returned to Italy and there are some 10000 objects along with 200 receipts that will provide many additional leads for the way that the antiquities market was operating. The frescoes are reported to have been stolen in 1978 from the Palaiopanagia Church in Steni, on the island of Evia. 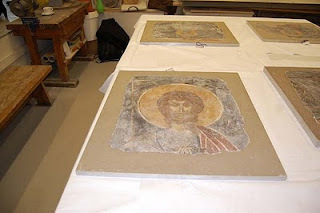 The four frescoes will need substantial conservation before they are placed on display in the museum at Chalkis. I was struck by the imagery of the official press release that talked about the wounding of this major Byzantine monument by those who operate outside the law ("«πληγωμένο» από τη βάναυση και παράνομη δράση αρχαιοκαπήλων"). Image from the Hellenic Ministry of Culture. Don't you mean to say that the Palaiopanagia Church frescoes were returned to Greece, not "Italy"? Returning them to Italy would have added insult to injury. Thank you for alerting me to this. The appropriate piece of the text has been corrected.